Recently, I have been reading Montaigne. The full ramifications of this have yet to be seen; he is an interesting figure, and his writings are even more so, full of anecdotes and ramblings. His works are deep and profound, but they’re also shallow and lighthearted. Simultaneously with contradicting himself, Montaigne seems to be right about everything, which is infuriating. I have also been working on the aspirational identification of myself with the heroic individual; I feel that this is a necessary step for me to improve my own life and the world. Undergoing this process is something that is painful, often difficult, and also requires equally painful and difficult soul-searching. One thing that I will do is consider maxims and then decide whether they are true or not. I try to come up with these as creatively as possible, or use what I read as an inspiration. I am everything in the universe. Now, I don’t know how much I trust the random thoughts that pop into my head. In fact, I actually trust them very little. My brain is very good at free association and wandering aimlessly and without purpose. Most of the maxims I try to apply to myself are true only in part, which is perhaps the fundamental element of the human condition. In any case, to the extent that the above statement is true, I don’t believe that it is necessarily a positive. At least, I do not interpret it in a sort of heliocentric egoism. Rather, I think there is something to be said for the human spirit as a tabula rasa. Not necessarily in Rousseau’s noble savage conception of it, but rather in the sense that a person undeveloped can turn into anything. I grew up in a traditional Christian upbringing, though I was not really acquainted as closely with theological traditions until I became older. Two important traditions within Christianity, or at least the sect of Christianity that I find myself within, are those of original sin and total depravity. Pairing this with the seemingly blasphemous maxim that popped into my head, it becomes immediately apparent that there are limitations to this, but it holds some truth. I am capable of becoming everything within my limitations. The problem with this is that it is not necessarily a positive statement. I’ve read a fair deal of Jung, though not as much as I would like. One of Jung’s most influential concepts in my life is that of the Shadow, the darker inner side of the subconscious that is hidden from our waking life. In my life, I have the luxury of being relatively moral. I have made, generally, decisions which I can look back upon with at least a veneer of respectability, though I would say that I have made decisions that have generally benefited the world. I might be barely breaking even, all things considered, but I am at least not dragging everything down. When I was a young adult, I had my first experience with holding a gun. My mother had paid for my brother and I to go to a firing range (I do not remember the circumstances that led up to this), and we had a rental lined up. I remember relatively few of the details; I was able to piece many of them together later from the benefit of reflection, but they are not as important as the general experience. When holding that gun, I had the realization that the power of life and death was in my hands. Perhaps, it would be appropriate to point out, it was only the power of death in my hands. Barring my initial anxiety–my knowledge of guns came only from the movies, and while we had gone through the basic safety guidelines my brother and I were left to our own devices on the range–the event passed without incident. I was not a good shot, and remain mediocre at best to this day despite a few more trips to the range, but the sensation was familiar. A similar sensation washes over me when I drive a car, a knowledge that I have within my capacity a great deal of harm. For a while, I lived in terror of this feeling. I could not put it in words, but my own danger, that is, the danger I posed to the world around me, scared me. The result was internal conflict. In the Jungian sense, I had awoken a dragon within my Shadow, but I had not figured out how to confront it. Later, when I was reading Jordan Peterson’s 12 Rules for Life (affiliate link), I would discover that this is a common ailment. I had not considered the fact that everything resides inside me. This is not to be interpreted as a manifestation of hubris, because the everything within is not manifest in a complex form. Rather, it is as if the elemental motives that make up reality, matter in the sense that the things that matter are matter, all exist within me. They are latent, but awaken in tune with my spirit. To overcome the dissonance within my psyche, I had to reach the realization that I was not just a good person. The notion of a good person is so vague by definition that it is easy for us to categorize ourselves as such. I often witness children ask if they have been good or bad, as if seeking exculpation. The truth of the matter is that nobody can make that assessment on a reasoned basis. The complexities of reality are such that judgment to the point of condemnation (though not judgment to the point of discernment) is impossible. The truth is more complex. As I mentioned earlier, I have begun to better envision what a “good person” is; I have begun a process of alignment with the heroic individual who embodies those virtues that I wish to embody. The counterpart to that is recognizing that there is a fraud, a war criminal, a traitor in every heart. Each step taken toward virtue means a step taken away from blind convention. Peterson would describe this as going from order to chaos, and this is a good conceptualization of the process. There’s a Nietzsche-like element to the process. Stepping away from habit and toward a place where one can develop virtue also leaves one prone to stepping into darkness. The pursuit of light does not come without a risk of hypocrisy, of bringing the wrong elements of the self into dominance. This is the Jungian Shadow: you are sheltered from your weaknesses by sticking to the rut, but to move beyond you must confront the worst elements of yourself and risk disaster. The dragon I had to fight–the adversary I am still facing–is that the potential for great disaster lies within my own self, within my best intentions and the potential for me to give into baser desires. I am everything in the universe, in its basest form, and that’s not as good as it might seem. I strive to inflect myself in such a way that I develop into the ideal; to pick up my cross and follow the righteous path. One of the things that I often struggle with is explaining to people why literature is important. It’s not for lack of faith in the topic, or any particular hesitancy to share, it’s just a complex matter. However, I’ve been doing some reflecting recently and I think I’ve come up with a good explanation. Stories teach us how to be a Hero. Not a little-h hero, but a capital-H hero; someone who engages with the universe. Recently I finished reading Carl Jung’s Man and His Symbols (affiliate link), and it’s been one of the most enjoyable books I’ve ever read, albeit a difficult one. I’m going to start off with a review of it, then move into my more personal thoughts to better organize them. I read Man and His Symbols on Kindle, and it was well-formatted and organized. All the illustrations appeared clear and there were no perceptible typographical issues. Looking at a book like Man and His Symbols it is hard to give a definitive review because of its nature. It is an overview of a lifetime of work, compiled not only by Jung himself but also by Joseph L. Henderson, M.-L. von Franz, Aniela Jaffé, and Jolande Jacobi. The foreword by John Freeman is also of interest, and helps quite a deal in preparing the reader for what they should know about Jung. Man and His Symbols is the first book by or about Jung that I have ever read, so I approach it as a novice who had some knowledge of Jung’s analytical psychology, but not strictly speaking all but the briefest of understandings. My knowledge was influenced more heavily by people like Joseph Campbell and Carol Pearson who have built on Jung’s ideas but approached them in a much different direction. So with that said, many of the concepts were at least familiar to me, though my understanding of them was far different from what Jung’s intent was, colored as I was by casual discussions and partial understandings. Actually reading Jung’s work first-hand in a manner intended for novices like myself changed my understanding of his philosophy and understanding of the psyche dramatically. Each of the writers featured in the book has their own approach and intent, but the core concepts remain the same. In this way, I think that Man and His Symbols may actually be an ideal introduction to the work of Jung; Aniela Jaffé’s interpretations of symbolism in art particularly helped me break down some of the concepts. Through drawing on the various authors, Man and His Symbols becomes a conversation as much as it is a statement, and it is much better for it. I have launched into Jung’s Modern Man in Search of a Soul in audiobook format, and the comparison of the two perhaps best presents an opportunity to describe Man and His Symbols in a way that makes sense. Man and His Symbols is a survey of Jung’s ideas. It’s deep nonetheless, but the traversal into this depth is assisted by the various inflections that the different contributors to the volume add. It benefits from having a vast array of inputs, including connections to mythology and legend as well as anecdotes and examples of psychoanalysis in practice. This give an opportunity to fully express the notions it contains, but not necessarily to explore them fully. It is a starting point for further reading, either of Jung or those who were inspired by him. There were things in Man and His Symbols which I understood the concept of, but not all the nuance of. Jung’s explanation of the collective unconsciousness, for instance, didn’t really click for me: I understood what its role was, but not what its essence was. Modern Man in Search of a Soul is a different sort; it is a very detailed study of one particular topic, and while it too draws from mythology, anecdotes, and psychoanalysis in practice it is much more deep: if it were the first work of Jungian analytical psychology that I had read I would be greatly distressed by trying to understand it, but as a follow-up to Man and His Symbols it is quite interesting. So, in short, my review of Man and His Symbols is best summed up in the following: If you want to know more about Jung and you are willing to spring further into reading, Man and His Symbols is invaluable. If you want a survey of Jung followed by interpretations by his followers, Man and His Symbols is incredible. If you are already familiar with Jung and understand his work, but you want to dive into the deepest depths of Jung’s works, Man and His Symbols contains interesting overviews. It is not that it is shallow, but it is merely scratching the surface of the depth and complexity of Jung’s total work. Man and His Symbols is an interesting book, to say the least. As far as reading books for the purpose of self improvement, it’s definitely in the top five or so books that I’ve read, and I know for a fact that Jung influenced Jordan Peterson, whose 12 Rules for Life I not only enjoyed but also benefited personally from; Jung’s work is also referenced in Peterson’s Maps of Meaning, which I have been reading on-and-off for a longer amount of time than I care to admit to (admittedly, it is a rather voluminous tome). While finishing up reading Man and His Symbols I also listened to Johnathan Haidt’s The Righteous Mind, though I did not write reflections on it and I don’t currently plan to. However, there is an interesting intersection here. One of Jung’s teachings is the collective subconscious, and while Haidt’s work seems at first to dissuade from such an assertion (after all, he finds that moral judgments are generally culturally instilled), he has also found moral foundations that seem to underlie these moral decisions. In essence, what people value, and how they perceive the outcomes of actions, influence their tastes. The moral foundations seem to be themselves tied to some sort of universal human mode (assuming, of course, that they are not hogwash) of thought. This seems to line up well with the notion of Jung’s collective subconscious, and help to explain theories of the mind and how it interacts with archetypes. In the interest of full disclosure, I have put off writing this reflection for almost a week, and in that time I have also listened to a good portion of Modern Man in Search of a Soul, which means that my reflections are therefore colored by both Haidt’s work and further readings of Jung. Since reading Man and His Symbols, I have become very conscious of my dreams. I do not mean that I am hyperaware of them, though I think I may remember them better than I used to because I have placed an increased importance on them, but rather that I spend more time reflecting upon them. The results of such a self-assessment can be both encouraging and discouraging. On one hand, I have been able to reduce my stress and give myself a more positive outlook on life (though the portion of my life that I have entered into is the happiest of my life, and God willing it will remain so), but on the other I ask more questions, more deeply. In this sense, reading Man and His Symbols has created for me a small conundrum, namely that of self-analysis, which carries dangers in and of itself (Shakespeare is not errant when he writes that the eye sees not its own reflection), but it has also practically helped me to sort out some of my anxieties. As someone familiar with Pearson’s work, the concepts of the shadow and the archetype are not novel to me, but Jung’s explanation is derived from his fascination with the mind, rather than the more practical slant that Pearson takes. A year ago, I would have disdained Jung as being quasi-mystical. I don’t deny that there is an element of the mystic in him, but my perspective on that aspect of his life has changed. Jung is clearly in awe of that great unknowable, ineffable, uniquely human element of the mind-psyche-soul that blends conscious and unconscious. Reading Jung, one is struck by how much less we have learned than we think we have. Haidt writes about people who have suffered injuries to the parts of the brain that are associated with emotion, and how they are paralyzed by analysis and make worse decisions than their uninjured counterparts. The anima and animus concept were known to me at a very basic level before I read Man and His Symbols, but I didn’t really understand them until after reading (or, at least, understand them as well as I now do). I think that it’s an interesting thing to consider, especially when looking at characters and how they’re portrayed/developed in fiction. Part of what I really enjoyed about the book and is probably more personal than broadly applicable is the way that it really helps draw connections between symbols. I spent a lot of time studying literature before I ever really learned to identify symbolism, and that’s something I’ve been trying to compensate for now that I’m aware of what I was missing out on. I’ve been reading and listening to a lot of Jung recently, and I’ve been in a section of a book called Man and His Symbols (affiliate link). Before I go further, I should point out that I’m not much of an artist. I have an appreciation for art, and some basic theory, but not much in the way of practice or (barring some rare instances) interest in creating art. I have aphantasia, meaning that I cannot consciously evoke an image in my mind (though I can contemplate concepts and have vivid dreams, which I can often recall images from in waking). As I have been reading Man and His Symbols, I have recently reached a section by Aniela Jaffé entitled “Symbolism in the Visual Arts” which talks about the use of symbolism in images. As someone who is not “a visual person” to steal the language of laypeople, I have often been fascinated by abstract art (though I have a philosophical distaste for postmodern denials of the presence meaning in art), and I’ve been spending some time contemplating the role and presence of symbols in visual works. Another thing that Jung mentioned in Modern Man in Search of a Soul (affiliate link) is that it’s not uncommon for people to take up the pursuit of a creative endeavor as part of a program of self-discovery; not because of usefulness but precisely because it is a form of self-expression without any other utility to the individual. Since I don’t draw or do art in any meaningful sense, this makes some logical sense for me as an outlet. For the past couple days, I’ve had an image in my mind of a mandala; these are representations of the self, cosmos, and universe. The mandala takes the form of a sphere with two internal squares; one oriented as a diamond and the other smaller within it. The divisions are such that three “rings” of eight pieces are formed within. In my mental image, the mandala is also colored and rotated off-kilter, but as I drew it out in Inkscape I did not think it to be important to start with this. Growing up in America in the 1990’s, I always took the lyrics of this song to imply ethnic unity under the banner of the Protestant faith, but as an adult looking back to it decades later, an alternate symbolism occurs to me. Red, yellow, black, and white are the colors of the four humors (depending on what coloration one assigns to phlegm; while phlegm is not usually depicted as white it was so in my own mental conception of the humors at the time of the image) and the processes of the alchemical magnum opus. As the Hermetic perspective on alchemy is to bring the incomplete toward wholeness, there is a logical continuation of these elements within the mandala. The organization of the mandala into sections like this runs against what I would normally picture; I would rotate each ring to be in the same general pattern as the first, yet in the mental image we see that the outer rings have the pairings in sequence with each other; instead of going yellow-red-white-black-yellow-red-white-black they go red-yellow-red-yellow-black-white-black-white in a clockwise manner. It is worth noting that each of the internal colors is “impure” (e.g. not primary); both so that the dividing lines that separate them remain distinctive but also because this is proper: the transformative process is not instantaneous. I kind of feel like I have a Norton anthology from my college days whose cover has colors similar to these (or perhaps even a mandala or mandala-elements similar to these), but I can’t be bothered to dig it out to check. However, the mandala in question is not the sole object in the mental image; I have the perception (albeit abstractly) that it is in some way on concrete, that it is at an angle, and that there is a sol symbol in one of the elements of the mandala. To bring this into actualization, I used an image from Morguefile, a royalty free image repository. Uploaded by the user “scottglennie” it depicts a straight-on view of concrete. The presence of discordant elements within the concrete matches the mental image I have had. In my image, the mandala is distressed, worn down by the presence of the world. In Krita, I imported the image that came from Inkscape and rotated it to its proper orientation, then penciled in the sol-image. 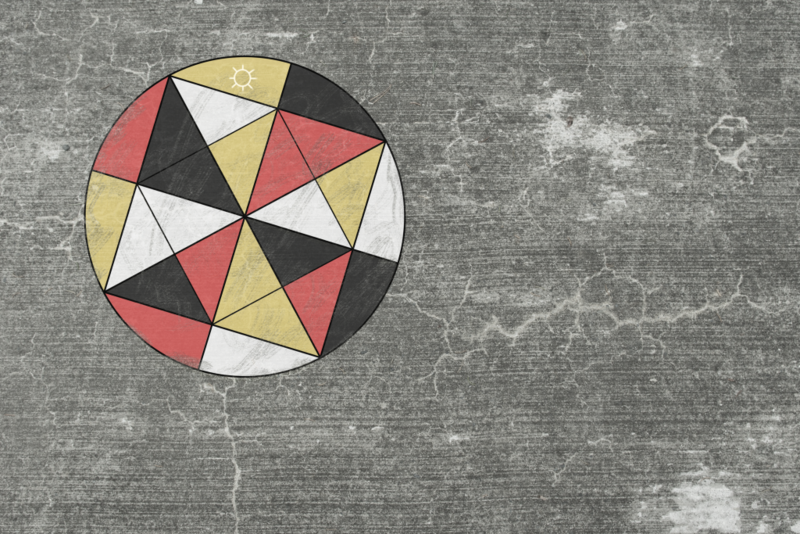 The sol-image is not distressed like the other elements of the mandala, but the barriers between the mandala and the outside world are particularly distressed. I’m not sure what the reason for this image is (or, for that matter, if there is one), but I am certain that there are deep symbolic meanings to it. 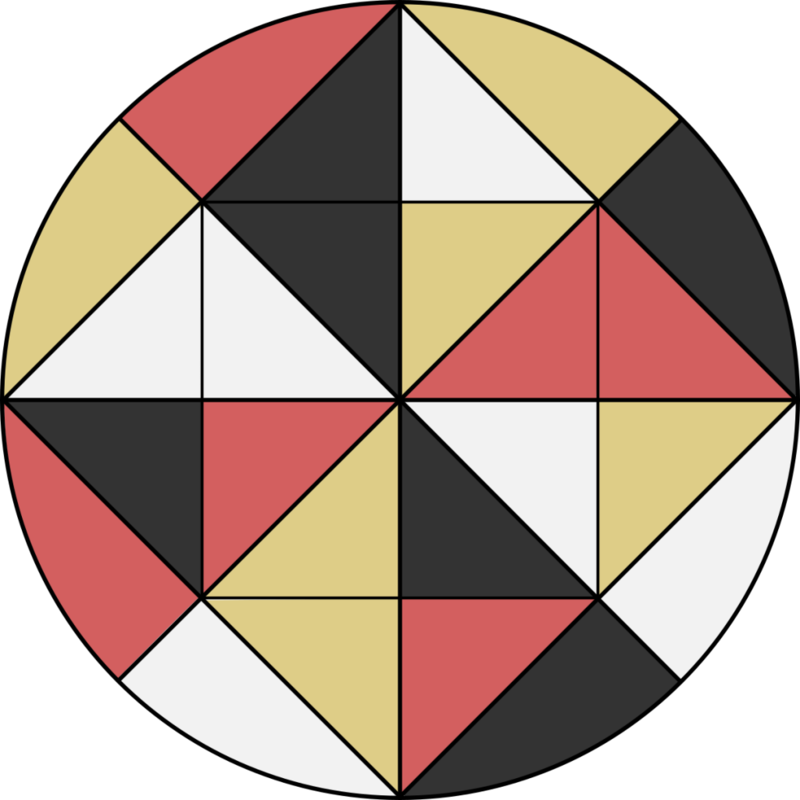 Dividing the mandala into quadrants, we can see that there is an imbalance between the parts; each has two colors that appear only once, and two that appear twice. Combined with the distress that occurs around the rim of the mandala and the imbalance, I think it is fair to say that these elements represent chaos, though it is also important to note that the mandala is balanced within the whole if not the parts. The presence of the sol symbol is not something that I have any experience with; a purely abstract mandala would omit it, but it is also not part of a larger zodiac or associated group of elements. Its presence at the top of the mandala may indicate something like a steady course. If pressed to rationally explain this, I feel like my life is in some semblance of order, even though I have a certain amount of stress and responsibilities, so it is possible that my unconscious mind is creating this image as a representation of the combination of chaos (responsibility and uncertainty) and order (preparation to meet that responsibility and guiding compass of plans, morality, and ethics) in my life. The distress on the mandala represents the conflict between the individual self and the wider world. I tend to be introverted to an extreme, avoiding serious relationships outside of those governed by my livelihood. One of my goals as I pursue some psychological development and self-analysis is to break free of some of those self-imposed restrictions: to be more spontaneous, agreeable, and open within rational limits.